This late 1920's or early 1930's era Parker Pony truss was moved to this location in 1966, according to records. Abutments are poured concrete, span supports are steel piles. The deck is wood, but judging by the placement of the safety guards, it is likely that this bridge had a concrete deck in its first life. Apart form that, all the details of this bridge's super structure are standard. This design bridge was Oklahoma's most popular, and probably most versatile, as this moved example does attest. 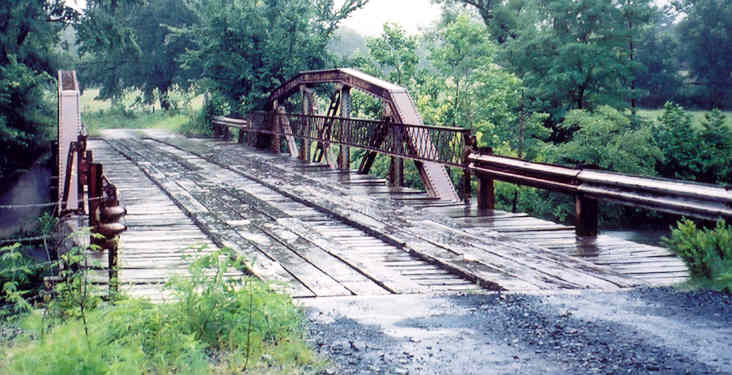 The bridge stands near Muse, in the valley just south of Winding Stair Mountains, and the truss span is 80 feet long.